A Whole New World of Alan Menken was a magical experience to say the least. The Oscar, Tony, and Grammy-award winning composer and pianist performs a one-man retrospective show, a must-see performance for any Broadway lover! Having bought tickets for my parents and I to attend, I had fully planned on just enjoying the evening sans notebook, but was so moved that I found myself scraping around for paper and a pen for all of my thoughts. 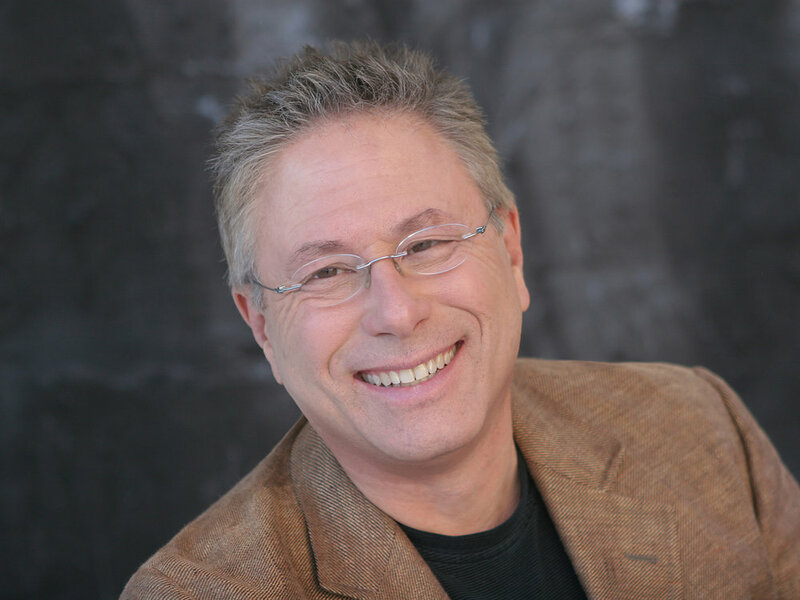 Alan Menken guides the audience through his 40-year career filled with highs and lows. From humble beginnings to creative powerhouse, the audience is exposed to the insider’s scoop to many incredible stories and treated to familiar medleys. It’s like being inside the Disney studio. Menken’s genius lyric partner earlier in career was Howard Ashman, who worked on Kurt Vonnegut’s God Bless You Mr. Rosewater, Little Shop of Horrors, Little Mermaid, Beauty and the Beast. Ashman’s untimely death in 1991 shook Menken and as death often does, it unsettled Menken about what would happen next in his career. He explains having to finish Beauty and the Beast without his friend and partner. Sitting down to his piano ready to hit the tape deck to record some ideas, thankfully instead he pressed the play button only to find the material Howard and he had been working on, which ultimately became Tale as Old As Time. Throughout the evening the anecdotes and stories flowed together seamlessly. The story of a young kid from a family of dentists to 8-time Oscar Award winner. Menken explains how ironic life can be with wins and losses happening simultaneously on and off the screen/stage. Menken’s charisma and hilarious quips makes the night even more enjoyable. He connects with the audience is such a humble and genuine way. At intermission I turn to my parents and see beaming smiles on their faces. 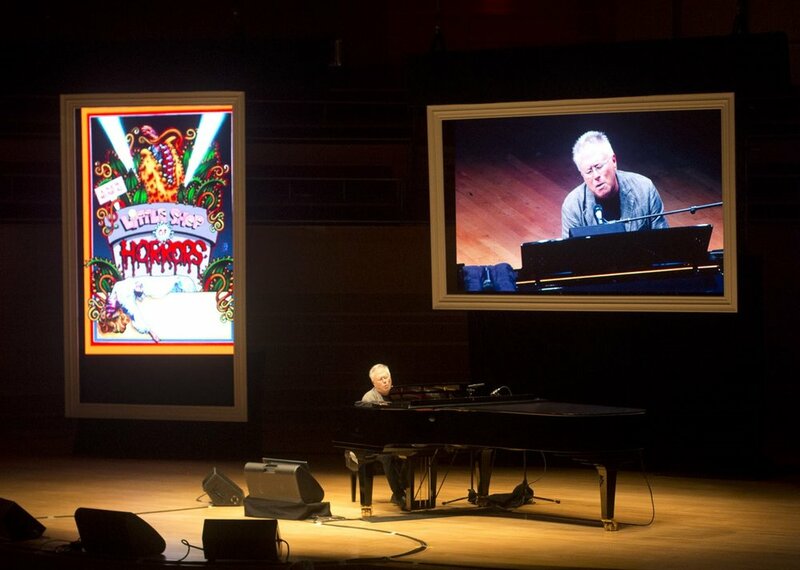 The stage was composed with three large picture frames above a grand Yamaha piano; one vertical and two horizontal. The far left vertical would show the promotional posters for each film, Broadway show, etc. A pop up text underneath the posters included who wrote the lyrics for the song, the nominations the song or score gained, and the awards it had won. The center contained the live video stream of Menken’s performance. Three camera angles readily filming away; one straight on front stage, the left camera for facial close ups across the piano, and a third behind the piano for close ups for his hands on the keys. The far right horizontal frame would include images of Menken throughout his life, as well as include bonus footage working with Howard, interviews with Menken’s wife, or a screen grab from the film or production. The visual set up was well placed and put together. There was also closed captioning downstage right, which is wonderful! Being a one-time event, it was lovely to see inclusion being promoted and means a lot. Following the intermission, the audience is now at the start of the millennium and September 11th just happened. When the movie Home on the Range came out, the creative team struggled in how to have a moment within the film to convey what the country was feeling at the time. How do you encompass what the world is feeling? The song “Will the Sun Ever Shine again?” is emotional and although within a comedic movie pays a small moment to the larger events happening in the world when the film was released. Newsies (*fangirl screams*) is a great example of a flop turned into a second chance. The original 1992 film by Kenny Ortega received not great reviews and Menken got his first Razzie award for the song “High Times, Hard Times”. Years later, there was a resurgence for Newsies. A surprising infatuation that just kept cropping back up. A new generation and a new audience connecting with the music and story like never before. Many of the projects Menken’s worked on have a longevity and life spanning decades. The opportunities he has had to revisit projects and expand the score in ways that it never got a chance the first time around due to movie constraints.